Krugersdorp based facilities management company Bosasa allegedly paid bribes to a host of government officials, prosecutors and politicians for years. Cash in little grey security bags was dropped off at homes, handed under restaurant tables, and concealed in newspapers. It was an open secret at Bosasa - almost every current director has been implicated in either paying the bribes themselves or having knowledge of it. And quietly, for years, Bosasa's chief operations officer Angelo Agrizzi, who was at times responsible for organising the cash bribe system, was taking coded notes in his leather-bound A3 notebooks. 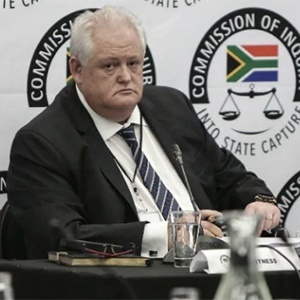 For followers of his testimony before the commission of inquiry into state capture in January, Agrizzi's little black books are now infamous. On Thursday, as he started his second stint in the witness stand. Agrizzi, in his characteristic blasé manner, admitted he lied to protect the company during a massive tax fraud. He admitted to being present when bribes were paid to politicians, in itself an offence in South African law because he did not report it. And he has revealed the names of those who were paid - decoded and in excruciating detail before the commission. For the casual observer, this testimony is difficult to follow. It's tedious at times as the granular detail of a man's handwritten notes from years ago are discussed, down to the minutiae of smudged thumb prints. But this is the crux of Agrizzi's testimony - the detail that seeks to confirm the overarching narrative that has dominated the Bosasa story since 2009 - Bosasa paid bribes for tenders. It is this detail that has many people worried, and should have people lining up outside the commission to apply to cross examine. Strangely, this has not happened. Only one - Nomvula Mokonyane - has publicly denied the allegations against her. Bosasa managed, through spokesperson and director Papa Leshabane at one point said the company would wait for Agrizzi to complete his testimony before stating its version. This is yet to happen. Agrizzi will have a tough time proving some of his allegations under cross-examination or otherwise. His ride is set get rough. But one fact is undeniable - Bosasa and its corruption is inseparable from the ruling party and its deployed officials. The list of more than 30 people Agrizzi alleged to have accepted bribes over the years have a lot to answer for. He has named them before, and repeated many names again on Thursday. The question now is whether or not the evidence will present itself to prove his allegations. Agrizzi is continuing his testimony on Friday and the revelations are sure to keep coming. Deputy Chief Justice Raymond Zondo, who chairs the commission, asked a crucial question on Thursday. For years, Bosasa has been in the media over allegations of corruption. But it seems, Zondo noted, a blind eye was turned. The answer to that question may be simple. One day, the ANC will have to answer about Bosasa's intricate involvement with the party, and how the nexus of politics, money and corruption led to years of malfeasance. The devil is in the detail. And the details will be crucial in proving just how far the Bosasa net was cast.